Published on April 5, 2011 by cara.b.b. you might think that it’s all rainbows and marshmallows around here, but let me be the first to tell you that it’s not. sunday was a rough night – the short guy was up about every 90 minutes – so yesterday i was not feeling too fabulous. that said, my outfit consisted of leggings covered in dog hair and a t-shirt from 1986, topped off with an off-kilter ponytail and glasses. i’m sure my husband loved coming home to that. my mom tried to get me to take a picture, but i thought i’d spare you – i think the mental image is enough. but today is a better day! beckett slept so much better last night, and i’m a much happier mama. 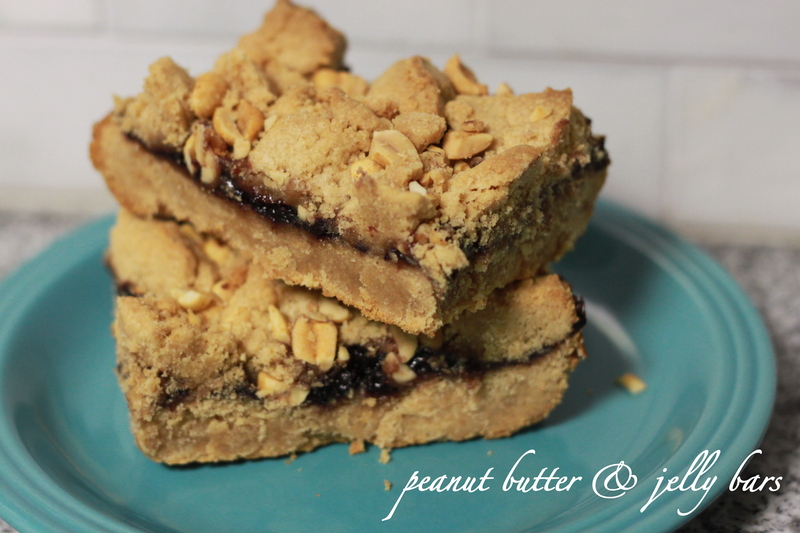 i was watching the barefoot contessa in my stupor yesterday, and she made peanut butter and jelly bars – hello! i decided to get my hands dirty during nap time today using this recipe. i added about an extra 1/4 cup of sugar to the dough, and i think i’d add more jelly next time, (this is not a lo-cal treat, so why not, right?) but they are still so so good. an indulgent treat that harks back to childhood – doesn’t get much better. I’d take one of those right about now. They look tasty! I still heart pb&j.